Some of Don Marquis’s most fantastic, imaginative pieces of writing never earned him a dime. They were the private letters he wrote to friends and strangers alike — long, winding affairs, full of whimsey and wild surmise, sometime punctuated with shockingly dark humor. If you read a letter published on this site earlier this year, “My Dear Miss Hickman,” you get an idea of what I’m talking about. 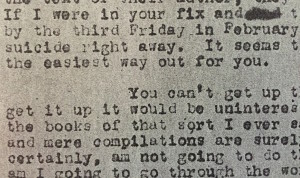 But perhaps no letter of Don’s can match the current submission: a five-page, single-spaced reply to the librarian of the Little Rock (Arkansas) Public Library, who had innocently inquired, in a letter dated February 7, 1927, if Don would please identify a sampling of his best works and also who did he regard as his contemporaries in the field of humor writing. The librarian, Vera J. Snook, was to give a talk at the library on “Wit and Wisdom of Modern Humorists,” and the date of the program, February 18, was fast approaching — less than two weeks away. Could Don help? His reply sets a new standard for dark humor. 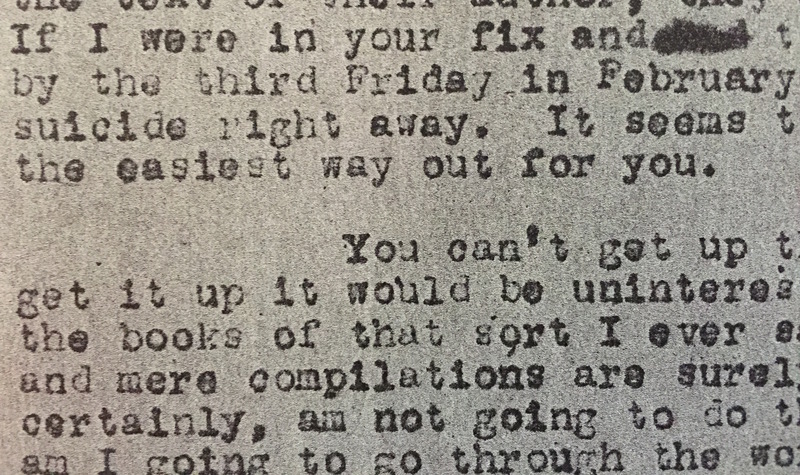 Don’s letter was dated February 11, 1927, and before the end of the second paragraph he tells Miss Snook that she’s in over her head and can’t possibly complete her task in time, and her only recourse is suicide! He explores the pros and cons of various methods of suicide, while admitting that maybe there are a few other options still available to avoid giving that fast-approaching talk. A hastily arranged wedding, perhaps? Or maybe — c’mon, you knew this was coming — maybe she should just read Don’s letter to her audience at the library and be done with it. This letter has never before been published. A carbon copy was found, along with Miss Snook’s polite missive, among the papers of Don’s biographer, Edward Anthony, in the special collections department of the University of Oregon library in Eugene. Phone calls to the Little Rock Public Library and searches of online databases and Arkansas newspaper archives have failed to provide the rest of the story: What did Miss Snook do? Was she shocked and appalled by Don’s outrageous suggestions? What did she tell her library audience? We simply don’t know. There is a clue, however, that suggests Miss Snook wasn’t scared off by Don’s bold letter and may have enjoyed the exchange. A second letter from Don to Miss Snook is also among Anthony’s papers at the University of Oregon. It is dated a year later — March 30, 1928 — and in it Don answers several oddball questions that Miss Snook passed along presumably from a library patron. The letter is friendly and engaging and charmingly grumpy in spots, as if Don no longer needed to impress a trusted correspondent.